Gardaí at the scene of the shooting of John Gibson in 2017. A 22 YEAR-OLD man has been arrested in relation to the fatal shooting of fitness instructor John Gibson more than 18 months ago. 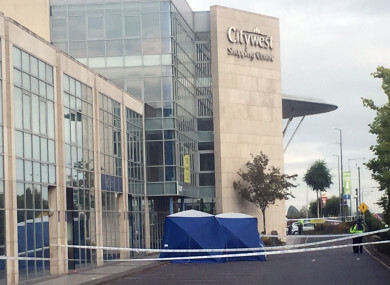 The father-of-two was shot a number of times in a car park at Fortunestown Lane near Citywest Village Shopping Centre on 18 September, 2017. Investigating gardaí believed that the deceased was killed as part of a local feud. This morning, gardaí in Tallaght arrested a man in connection with their investigation. The arrested man is currently being detained at Tallaght Garda Station under Section 30 of the Offences Against the State Act 1939. Gardaí added that investigations into the shooting are ongoing. Email “Man (22) arrested over fatal shooting of fitness instructor John Gibson in Dublin”. Feedback on “Man (22) arrested over fatal shooting of fitness instructor John Gibson in Dublin”.